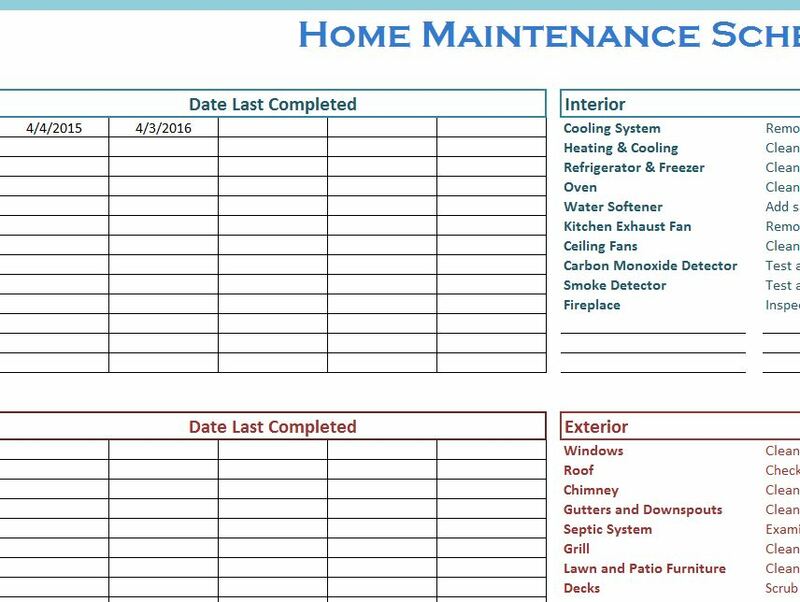 The Home Maintenance Schedule is exactly what you need to start organizing your home. This simple template will allow you to enter all the cleaning tasks you need to complete throughout the week and organize them in one convenient schedule list. Cleaning is just one of those things you simply have to find the time to do, but this template makes it easy. By listing the dates of when you last completed a cleaning item and a section that goes into explicit detail about what needs to be cleaned, your house will shine for years to come. Simply click the link below and you will begin the downloading process for this free template. Once you have the document open, start in the “Interior” table. This is everything that needs to be cleaned in your home. In the left side of the table just write down the item that needs cleaning. For example, if you want to dust the ceiling fan, you can just write “Ceiling Fan” in this section. Next to your item name, write a brief and concise description of the item you just listed. Going back to the ceiling fan example, you could write “clean the ceiling fan with the duster” and include which fan in your home you want to clean as well. Continue through the list and enter all relevant items in your home that need to be cleaned frequently. When you finish entering items into this table, you will do the same with the “Exterior” table. These are just items outside your home but still within your property (pulling weeds, mowing lawn, sweeping porch, etc.). When you clean an item, it will go in the “Date Last Completed” table for both interior and exterior list items. This way, you can take better care of your house by keeping everything frequently clean. Let your home shine this year by using the Maintenance Schedule.